Snowy Mountain Brewery and Saratoga Resort and Spa are proud to announce the upcoming live performance by Sam Platts & The Kootenai Three, Sundown at Noon in beautiful Saratoga, Wyoming. Enjoy their hard hitting Honky-Tonk of yesteryear on Friday, September 25th, 2015! This is an event that should not be missed! Admission is free, so grab your friends and head down to the pub for a night full of stellar music, dancing, and delectable food specials. Snowy Mountain Brewery hosts the best live performances, hands down! Now, it’s time to experience an unforgettable night at Snowy Mountain Brewery. 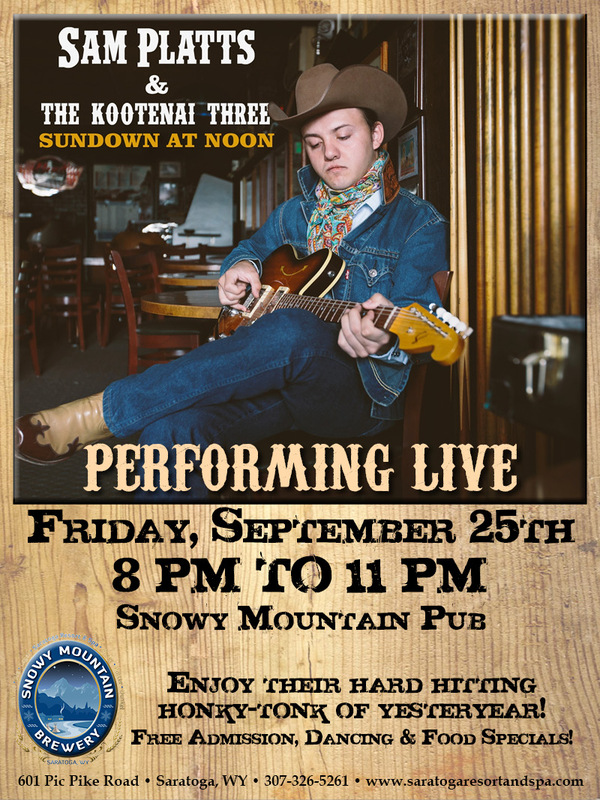 Join us Friday, September 25th 8pm–11PM for the live performance of Sam Platts & The Kootenai Three!